not reopened to American adoption. I expected to stay with it forever. The Russian Orphan Lighthouse Project had been my life for six years, though I'd volunteered for longer. It stoked a passion for Russia, brought me there 14 times, gifted me a son and a daughter, and allowed me to find adoptive families for ﻿﻿﻿﻿﻿﻿﻿﻿80 older orphans. Any list of the joys I found with Lighthouse would include some of my life's most fulfilling moments. Love of Russia could not blind me to its idiosyncracies, though. Russia never stopped feeling untamed, like a roller coaster just barely skimming its tracks. The country was touchy about everything adoption-related, yet I never imagined our program would end as it did, crushing a million tender dreams in the process. family who would have changed his future. positive, and two sibling foursomes―were headed to Lighthouse families, moms- and dads-in-waiting who had met and already adored them. It killed us to leave them behind, especially since it seemed so unlikely that they'd be adopted by Russians. In time, some of our kids did find Russian families, so at least they'd be loved. But to the best of our knowledge, few of our lost kids were so blessed. We brainstormed ideas, then participated in nationwide family-agency-U.S. State Department conference calls which happened frequently at first, then slowed until hope died altogether. It would not have helped our Russian kids, but eventually we began looking to other countries for work. I traveled to Ukraine, and was on the verge of going to another country. Nothing materialized. And though my heart never moved on, my life finally had to. On my trips to Russia, I'd never actively looked for children to adopt myself, though my eyes were incessantly open. During those years, three kids endeared themselves to me so much that I would have adopted any of them had I been able to arm twist my husband. But as much as his no's grieved me, I realized that the Lighthouse Project was all-consuming, and that by not adopting one orphan, I stayed able to serve many. Then it all dried up anyway, not by my will, but seemingly by Vladimir Putin's. In September 2013, when expectations for Russia were running on fumes, my friend showed me a photo of a young Chinese girl. Even with unwanted free time on my hands, I still wasn't looking to adopt, hoping Russia might reopen. Further, the child was blind, which terrified me. So I did all I could: just prayed that the Lord would call a family. In mercy He answered―by calling me. After a maddeningly tortured path, Eliana joined our family in February 2015, through a process so circuitous that its ultimate success scuttled any doubt that she was meant to be ours. Ironically, while battling for Eliana's adoption, I still greatly feared bringing home a blind child. Several parents encouraged me, claiming that their blind children were children first, and that blindness was the least remarkable part of who they were. I hardly dared believe it, but soldiered on out of duty. After her homecoming, though, I became the staunchest of believers; Eliana swiftly and gracefully compelled me to view her as only my daughter. Home nine months now, she has greatly exceeded my most optimistic expectations; her joy, positivity, sweetness, intelligence, and 20/20 heart vision define her so much more accurately than "blind" ever could. Every day since she's been home I've felt thrilled by the gift she is. So much that we are adopting again―another blind girl from China. Eliana loves to help, and is entirely capable. As Eliana flourished, my soul began aching for orphans with special needs like hers. Seven weeks ago, the friend who'd showed me my little one forwarded information about a trip to China quite similar to the Lighthouse Project trips I'd run in Russia. With two intensely personal connections to China through my daughters, I already loved the country, so my desire to travel was kindled. My Eliana had opened my eyes to children with special needs, and now I yearned to help them move from orphanages to families. At the beginning of November, I arrived in Beijing to meet Perry, ten, a winsome boy who would make advocacy for him easy once I got home. After our time together, I spent the last days of my trip at a foster home for visually impaired children. 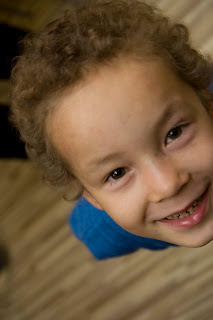 Blind children are among the most difficult to place; if only potential adoptive families knew what I know now! 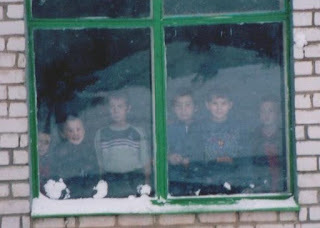 photo for my blog, Russian Orphan Lighthouse Project. and I pray some joy has come to their lives. Thus, my Lighthouse Project chapter of life is over. Like closing a spell-binding book of endless surprises, I deeply regret its too-soon ending. But I'll forever treasure the profound joy it brought me in those few years; a billionaire with ten thousand lifetimes would be less blessed. The Lighthouse Project―which was really only about the kids we helped―and those at the end who we couldn't―has already begun shaping this new work in China. As I say goodbye to Russia and its amazing story, I invite you to come along to meet China's unloved, but lovable, orphans with special needs. I plan to introduce them weekly on this blog, Too Special. I'd be honored if you subscribed and followed the blog at the right sidebar above. There are more kids we can love and help together, and that journey is just beginning. Eliana is indeed precious. I'm glad you are again advocating for orphans! We're itching to hear what you have to say. Thanks a million! Too Special, L.L.C., is blessed to partner with individual donors and an adoption fund to make grants available for the adoption of children with special needs featured here. Depending on the funding source, these grants may have specific restrictions for recipient families. For more information, contact Becky De Nooy of Too Special, L.L.C., at (616) 245-3216. My name is Becky De Nooy. I am blessed with six children from three countries: Guatemala, China, and Russia. While homeschooling takes much of my time, I love orphan ministry. 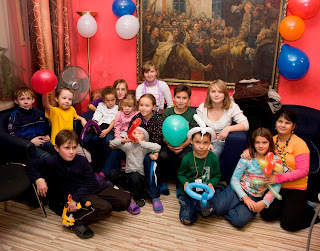 From 2004 until Russia shut down to adoption by Americans in 2012, I worked with the Russian Orphan Lighthouse Project, a true highlight of my very blessed life. With the Lighthouse Project, I coordinated 22 trips bringing 179 older Russian orphans to visit potential adoptive families, resulting in the adoptions of 80 children. When Russian work became impossible, I had time to adopt a fifth child, a visually impaired girl from China, who opened my eyes to the desperation of orphans with special needs. Since her homecoming, I adopted a second blind child, and I have become passionate about helping children like them meet their forever families. For information on adopting or parenting children with visual impairments, or for information on any child highlighted here, please call me at (616) 245-3216, or email me at beckydn@afo.net.